on airports (addons) there are sometimes problems with (for example) trees, objects or streets, that do not belong there. This then manifests itself in trees on the apron or even on the runway or civilian streets which run across the Airport or twice buildings (warehouses, terminals ...). In most cases, the reason is that in addition to an airport addon still area scenery such as OSM data (OSM2XP or World2X-Plane), Treelines, etc are installed. Also the standard OSM data from X-Plane 10/11 can cause this. 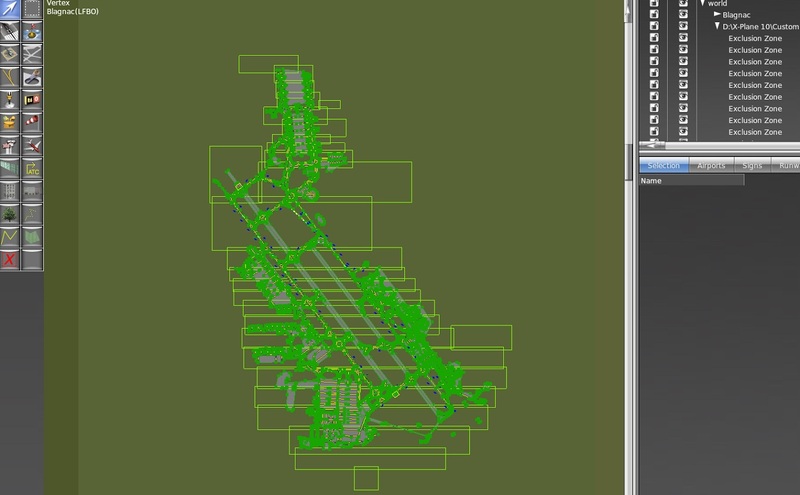 These area-addons / sceneries sometimes include Airport building or put trees (forests) by the Classification System / Global Airports within the addon (Airport) limits. If an airport addon contains no or too little / too few so-called Exclusion Zones, then sometimes you can see this opjects. They are not hidden. Trees on the runway ... ! Unfortunately, Exclusion Zones can only consist of rectangles. They e.g. can created with the World Editor (WED). If now a large rectangular exclusion zone around the Airport will be set, then objects are often hidden which are desirable (red markings). To avoid this, the exclusion zone must be built from many little rectangles. One big rectangle. The exclusion zone would hide object in the marked areas which are desired objects. And here: Many little Exclusion Zones. Only undesirable objects are hidden. While some airports have by themself Exclusion Zones, but the development continues (OSM, World2XPlane, X-Europe, HD mesh V3, V4, X-Plane 10/11 internal OSM / Streets ... etc ...). Thus, the existing Exclusion Zones are sometimes not sufficient. In X-Plane 10/11 you quickly can test it. If everything is good (it depends heavily on the other installed area sceneries), then of course are no needs for an additional exclusion zone to be installed. For all these reasons, I have even started to create separate, additional and more detailed Exclusion Zones for our Aerosoft Airports (as an DSF scenery). The exclusion zone scenarios must be copied to the Custom Scenery folder after extracting the zip file (you find the link at the bottom of this post). The (unzipped) Folder names are based on the matching addon (which must already be installed of course!). Addon (folder name): Aerosoft - LFBO Toulouse Airport and Aerosoft - Scenery LFBO Toulouse (must be installed). The new scenery for the exclusion zone must always be located directly behind the last entry of the correctly installed Airports (therefore zExclusions ... ). This applies to the Custom Scenery folder, but especially for the file scenery_packs.ini, which is also available in Custom Scenery folder. Otherwise, the additional Exclusion Zones don't work correctly. The important scenery_packs.ini is workable with a small editor. With cut / paste you can quickly move the entries. An advantage of this separate Exclusion DSF scenes is, that they are not changed when updating an airport and thus retain their function. Since X-Plane 10.35 there are more and more Airports in the "Global Airports". So more and more of our Freeware Airports no longer are needed.... because the "Global" Airport is the better airport. In future x-plane 10/11 updates i think, this airport folder will disappear from the custom scenery folder. In this case my zExclusions are no longer neccessary. You can delete it. (For example Stuttgart EDDS ...). Or you shall move the zExclusion behind the "Global Airports" in the scenery_packs.ini file if you see double buildings again. Otherwise the Global Airports don't have buildings. Version 1.7: incl. EDNY, EDXH. The file contains the appropriate Exclusion Zones for 31 Airports. Excellent and very useful work. Many thanks. an update of my exclusion zones is available. I only have changed the exclusion zone Altenrhein. So it works now with the UHD Mesh (alpilotX) too. All other Exclusion zones are not changed. Thank you very much Heinz. Really there are some very nice airports ruined by the OSM, in fact I have it disabled now. Need I install this exclusions zones to the add ons bought in the Aerosoft Store or just for the airports coming in X-Plane? 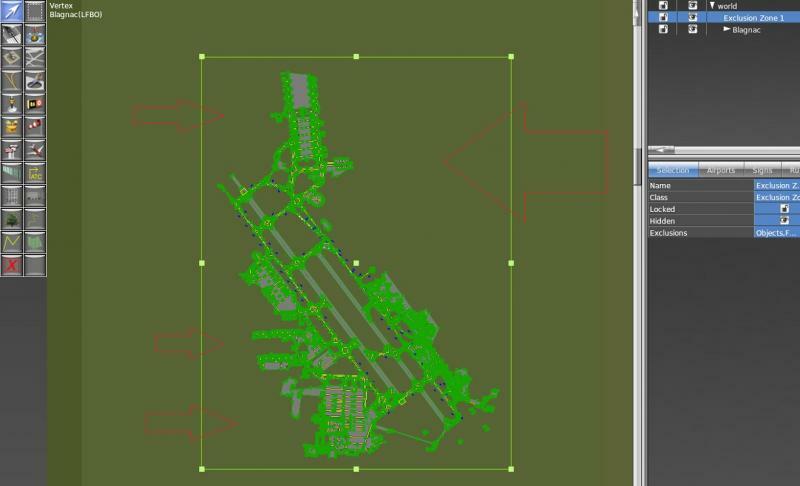 you shall install this Exclusion Zones for all Aerosoft Airports (coming as a free Addon with the X-Plane 10 Sim and for the Aerosoft Shop Payware Sceneries), if my zip-file containing the zones. But do it directly in the Custom Scenery Folder behind the respective airport and only if the airport is installed, (don't install the excl. zones in the Global Airports Folder or the OSM / W2XP Folders). See the installation instructions in Post 1! But if there are no double objects with an airport, than it is not necessary to install the exclusion zone for this airport. If you have an airport from our Aerosoft Shop and there are problems with the OSM or the Global Airport data (double objects...), and my zip file don't have an exclusion zone for this airport, than post it here. So i will try to make the exclusions zones. But please tell me your X-Plane 10 installation.version. Hi heinz, X-Plane is updated (10.35). I cannot send you the files, so I copy and paste them here. Disabling GPU timer for non-ATI hw prior to 10.9. Copy and paste here in the reply window is very unusable. But in the scenery_packs.ini there i don't see my exclusion zones. Where do you have them installed? In your part of the scenery_packs.ini, there is no entry for the Toulouse zExclusions. So they cannot work correctly. Hi again Heinz, thank you for your answer. The problem was that I could not find Aerosoft - LFBO Toulouse zExclusions when I downloaded the Exclusion Zones the first time, so I thought you didn't work in that area, but I have downloaded them again and now I can find it, so all is correct now. I'm kind of a X-Plane newbie so I guess I did something wrong. I downloaded the exclusion zones because I have buildings from OSM over EDDL like the tower you see in the picture. The exlusion zones didnt solved the problem for me. The tower is still there like in the picture. When I disable OSM everything is fine so I think something is wrong in my scenery_packs.ini ? i will check it... your scenery_packs.ini looks ok. But can you please tell me, if you have installed additionally a Mesh? For Example AlpilotX HD-Mesh V2 or V3? i have found some locations without exclusion zones. I will correct the zExclusion for Dusseldorf EDDL today. i've got the HD Mesh v3. Its the last entry in my config. here you find the new exclusion zones V 1.2. EDDL updated. http://forum.aerosoft.com/index.php?/topic/90632-exclusion-zones-fuer-aerosoft-airports-v-12-26042015/ (Bottom of Post 1). I hope, all is ok now. that is good. Thanks for the info. Do you know the ticket number? With "Aerosoft - EDDS Stuttgart" and "Aerosoft - EDDS Stuttgart zExclusions"
I have a problem. 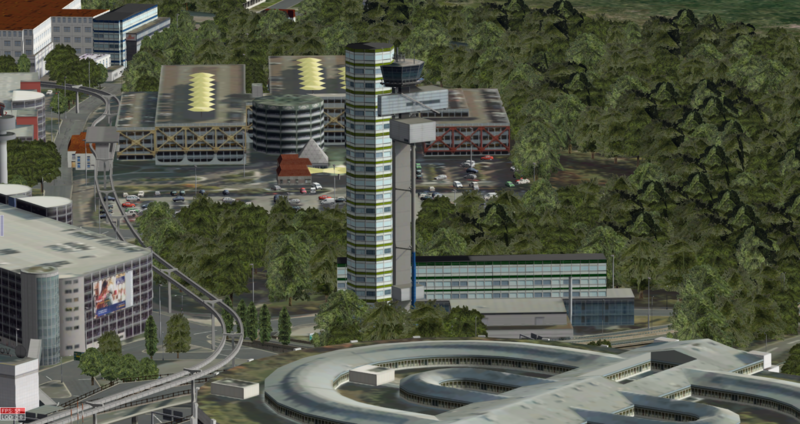 Adding "Aerosoft - EDDS Stuttgart zExclusions" all airport buildings diappear. Kan you tell my whey? Probably "Aerosoft - EDDS Stuttgart" is defect. so i have checked it. EDDS is now in the Global Airports available because it is the better Airport. 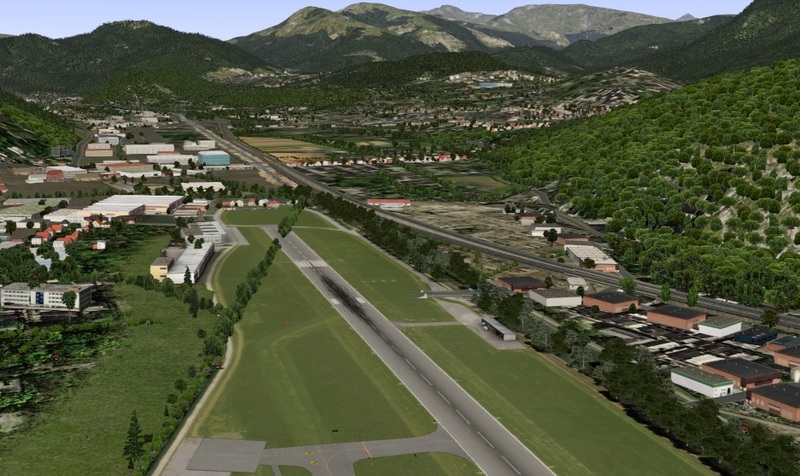 Our Freeware "Aerosoft - EDDS Stuttgart" don't have Buildings since X-Plane 10.35. So in this case my zExcluisons for EDDS are not longer neccessary. But f than there are double buildings again, than you can move my zExclusions behind the "Global Airports" in the scenery_packs.ini and test. I have posted it now in Post 1 too. Thanks Heinz for your information. I have deleted zExcusions for EDDS and it is O.K. and I did not find double buildings.